We present a methodology to quantify the starch content in the ovary primordia in sweet cherry (Prunus avium L.) during winter dormancy by using an image analysis system combined with histochemical techniques. Fadon, E., Rodrigo, J. Combining Histochemical Staining and Image Analysis to Quantify Starch in the Ovary Primordia of Sweet Cherry during Winter Dormancy. J. Vis. Exp. (145), e58524, doi:10.3791/58524 (2019). Changes in starch in small structures are associated with key events during several plant developmental processes, including the reproductive phase from pollination to fertilization and the onset of fruiting. However, variations in starch during flower differentiation are not completely known, mainly due to the difficulty of quantifying the starch content in the particularly small structures of the flower primordia. Here, we describe a method for the quantification of starch in the ovary primordia of sweet cherry (Prunus avium L.) by using an image analysis system attached to the microscope, which allows relating the changes in starch content with the different phases of dormancy from autumn to spring. For this purpose, the dormancy status of flower buds is determined by evaluating the bud growth of shoots transferred to controlled conditions at different moments in winter time. For the quantification of starch in the ovary primordia, flower buds are sequentially collected, fixed, embedded in paraffin wax, sectioned, and stained with I2Kl (potassium iodide-iodine). Preparations are observed under the microscope and analyzed by an image analyzer that clearly distinguishes starch from the background. Starch content values are obtained by measuring the optical density of the image that corresponds to the stained starch, considering the sum of the optical density of each pixel as an estimation of the starch content of the frame studied. Temperate woody perennials adapt to the seasons by modulating their growth and development. While they develop during spring and summer, they stop growing during the autumn to go dormant in winter1. Although dormancy allows them to survive at low winter temperatures, chilling is a prerequisite for a proper budburst in spring2. The important implications of dormancy in temperate fruit production and forestry have led to diverse efforts to determine and predict the dormancy period3. In fruit tree species, empirical experiments transferring shoots to forcing conditions and statistical predictions based on data of flowering are current approaches to determine the date of the breaking of dormancy, which allows researchers to estimate the chilling requirements for each cultivar. However, how to determine the dormancy status based on biological processes remains unclear3. Flowering in temperate fruit trees, such as sweet cherry (Prunus avium L.), occurs once a year and lasts about a fortnight. However, flowers start to differentiate and develop about 10 months earlier, during the previous summer4. Flower primordia stop growing during the autumn to remain dormant inside the buds during winter. In this period, each cultivar needs to accumulate a particular chilling requirement for proper flowering4. 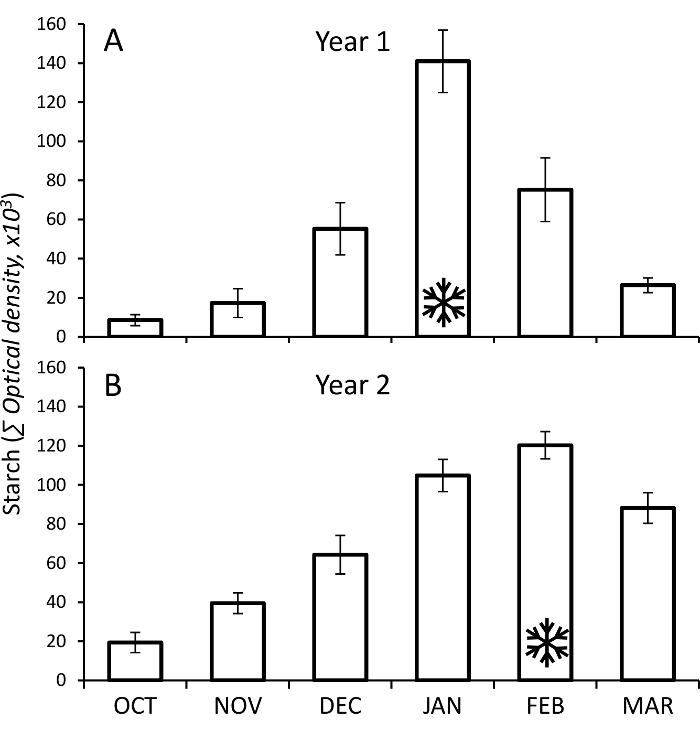 Despite the lack of phenological changes in the buds during winter, flower primordia are physiologically active during dormancy, and the accumulation of chilling temperatures has been recently associated with the dynamic of starch accumulation or decrease within the cells of the ovary primordium, offering a new approach for dormancy determination5. However, the small size and the location of the ovary primordium require a special methodology. Starch is the major storage carbohydrate in woody plant species6. Thus, changes in starch have been related to the physiological activity of the flower tissues, which need carbohydrates to support their development7,8. Different key events during the reproductive process are also related to variations in starch content in different floral structures, such as anther meiosis9, the growth of the pollen tubes through the style or ovule fertilization10. Histochemical techniques allow the detection of starch in each particular tissue of the flower primordia during dormancy. However, the difficulty remains in quantifying that starch to allow following its pattern of accumulation/decrease over time or comparing the starch content among tissues, cultivars, or years. This is due to the little amount of tissue available for the analytical techniques11. As an alternative, image analysis linked to microscopy12 allows the quantification of the starch in very small samples of plant tissue13. Approaches combining microscopy and image analysis have been used to quantify the content of different components in plant tissues, such as callose14, microtubes15, or starch16, by measuring the size of the area dyed by specific stains. For starch, it can be easily detected using the potassium iodide-iodine (I2KI) reaction17. This method is highly specific; I2KI intercalates within the laminar structure of starch grains and forms a dark blue or reddish-brown color, depending on the amylose content of the starch18. Sections stained with I2KI stain show adequate contrast between starch and the background tissue, allowing an unequivocal starch detection and the subsequent quantification by the image analysis system19. Although this dye is not stoichiometric, the accumulation of iodine is proportional to the length of the starch molecule, which can highly vary17. Thus, the size of the stained area expressed as the number of pixels may not reflect accurately the content of starch, since high differences in starch content could be found between fields with stained areas of similar size. As an alternative, the starch content may be evaluated by measuring the optical density of the stained granules on black and white images obtained from the microscope, as it has been reported in different tissues in apricot8,13,19, avocado10,20, and olive21. Here, we describe a methodology that combines the experimental determination of dormancy status with the quantification of starch content in the ovary primordium tissue from autumn to spring in sweet cherry, offering a new tool for the understanding and prediction of dormancy based on the study of the biological mechanisms linked with dormancy. Sample the flower buds in the field. Dormancy studies are long-term experiments and require adult trees big enough to collect buds and shoots all winter without compromising the trees’ development during the next spring. Special orchard management could be required depending on the training system; thus, pruning may be less severe than for fruit production purposes. Each week, from the start of autumn until the onset of bud break, collect and weigh 10 flower buds. Fix the flower buds by placing them into a 10-mL glass tube with a cap and soak the samples in a fixative solution of ethanol/acetic acid (3:1) for at least 24 h at 4 °C. Then, discard the fixative and add 75% ethanol, generously ensuring that it covers the samples. The samples can be conserved in this solution at 4 °C until use. Note: Vacuum infiltration can be used to remove the air bubbles inside the bud and prevent them from floating. This facilitates the penetration of the fixative into the tissues but could damage the structure of the tissues. Try to avoid it if not necessary. Sample the shoots in the field. Each week, from the start of autumn until the onset of bud break, take three shoots of 15 - 30 cm in length and 5 mm in diameter, containing at least 10 flower buds each. Place them on water-soaked florist foam in a growth chamber at 22 ± 1 °C with a 12 h light photoperiod. After 10 days in the growth chamber, pick and weigh 10 flower buds from the shoots. Evaluate the bud growth and determine the dormancy status. The sampling period has to be adjusted to the conditions of the location. In the orchard conditions (Zaragoza, Spain, 41°44’30” N, 0°47’00” W, and 220 m above sea level), the sampling of the shoots was carried out from November 30 until the end of February or the beginning of March. Weekly evaluate the response of the flower buds to the suitable growth conditions of the chamber, from the beginning of autumn until budburst in the spring, by comparing the weight of the 10 buds picked from the field. If there are no differences or those differences are less than 30%, consider that the buds have not fulfilled their chilling requirements and are endodormant22. If the differences are more than 30%, consider that the buds have fulfilled their chilling requirements and are ecodormant22. Select about six fixed buds from each sampling date (see step 1.1). Depending on cultivars, each sweet cherry flower bud contains up to five flower primordia. Remove the external bud scales and place the bud on a watchmaker’s glass with 75% ethanol to prevent it from drying out. Dissect the bud and extract at least one flower primordium per bud with the help of precision forceps and an ophthalmologic scalpel under a stereoscopic microscope. The flower primordium can be conserved in a 10-mL glass tube with 75% ethanol at 4 °C, or proceed immediately to the next step. Dehydrate the samples in a tertiary butyl alcohol series. Replace the 75% ethanol solution with 10 mL of 75% tertiary butyl alcohol (TBA) to generously cover the samples and incubate them for 1.5 h. A Pasteur pipette can be useful to discard the solution. Repeat step 2.2.1, adding TBA with rising concentrations (85%, 95%, and 100%, v/v; and 3x with pure TBA) in a drying stove at 30 °C with air extraction, since pure TBA crystalizes at room temperature (< 20 °C) and is very volatile and toxic. If TBA crystalizes with the sample, it would damage the tissues. Embed the samples in paraffin18. Melt the paraffin by introducing the paraffin pearls in the drying stove at 60 °C with air extraction the previous day. The paraffin pearls can be also melted on a hotplate, but ensure that the liquid paraffin is at 60 °C and not at a higher temperature, to avoid tissue damage. Replace the TBA with a mix of TBA and paraffin oil (1:1) and incubate for 24 h inside a drying stove at 60 °C. Then, replace the mix of TBA and paraffin oil with pure melt paraffin and incubate for at least 6 h inside a drying stove at 60 °C. Repeat it 2x and incubate the last change for at least 4 - 6 d.
Place each sample on a small metal base mold over a heat surface, embedded in paraffin wax, and pace the embedding cassette. Place it over a cold surface and remove the block once the wax is solidified. Section and rehydrate the preparations. Prepare Haupt’s adhesive: dissolve 1 g of plain Knox gelatin in 100 mL of distilled water at 30 °C; then, add 2 g of phenol loose crystals (C6H5OH) and 15 mL of glycerol. Spread the Haupt’s adhesive over a glass slide with a brush and add a drop of a 1% formaldehyde solution. Section each paraffin block at 10 µm in a rotatory microtome and place the sections onto the glass slide covered with Haupt’s adhesive. Place the glass slides with the sections over a heat surface at 35 - 40 °C until dry; then, move the glass slides to a slide rack. Prepare the dewax and rehydration solutions. Place 200 mL of Histoclear II in three glass-staining dishes, another one with Histoclear II:ethanol (1:1, v/v), an ethanol series (100%, 70%, 40%, v/v), and a final distilled-water wash.
Dewax the sections with three washes, each 5 min, in Histoclear II and in Histoclear II:ethanol (1:1, v/v). Place the slide rack inside the glass-staining dishes, ensuring that the solution completely covers the slides, and, then, move the slide rack from one solution to the next. Rehydrate the sections by the following series of 2-min washes: an ethanol series (100%, 70%, 40%, v/v) and a final distilled-water wash. Finally, dry the glass slides at room temperature. Prepare I2KI stain: dissolve 2 g of potassium iodide (KI) and 0.2 g of iodine (I2) in 100 mL of distilled water. Apply a drop of fresh I2KI over the section(s) for 5 min and, then, discard the excess of stain by absorbing it with a blotting paper. Quickly proceed to the next step. Apply a small drop of a synthetic mounting media, place a small cover glass on top, and press hard. Once the mounting media dries, observe under a bright-field microscope for a preliminary evaluation of the ovary starch. Note: This step is not mandatory, although a better contrast between the starch and the background is obtained. If the section has to be reused with other stains after starch quantification, place the cover glass over the drop of stain and discard the excess by absorbing it with a blotting paper (see 2.5.1). Then, after starch quantification, wash out the I2KI stain with distilled water and place the preparations over a heat surface at 35 - 40 °C until dry. Note: The detection levels used by the image analyzer to detect the stained starch are directly dependent on light conditions and magnification of the microscope; thus, fix these conditions for all the preparations evaluated. Adapt the adjustment proposed here to the available microscope and light conditions. Adjust the aperture diaphragm at the 20X magnification and the brightness control or light intensity. Make sure that there are no filters on the filter holder, and select a bright-field condition in the microscope. Select a suitable magnification (e.g., 40X for sweet cherry ovary primordium). Control the image acquisition conditions. Adjust the camera settings with a stained preparation without tissue via Image | Acquisition | Pre-view. Fix the brightness at 50%, the gain at 1.0x, and the histogram indicators the gamma value at 1.00 and the contrast at 0 - 100, lining up with the limits of the brightness distribution histogram. Activate the overexposure/underexposure function and adjust the exposure time at the limit of overexposure. Apply the white balance function to the complete image to display all neutral-colored components of the image without any color tone and the shading correction to the complete image to create a corrected and homogeneous image. Calibrate the Image Analysis System to obtain the control values of the grey level (0, black; 255, white) of different optical densities (OD) that are obtained by the transmittance (T) values. Acquire an image of a stained preparation without tissue, considered control white, and measure the grey level of the black and white image via Measure | Grey measure | Calibrate grey | Reference value = 0 | Measure | Calibrate | OK. This corresponds with a 100% transmittance; thus, an optical density of 0, according to OD = 2 - log T.
Acquire an image of the same preparation with a 4N filter, which reduces the amount of light 4x, and measure the grey level of the black and white image via Measure | Grey measure | Calibrate grey | Reference value = 0.6 | Measure | Calibrate | OK. This corresponds with a 25% transmittance; thus, an optical density of 0.6, according to OD = 2 - log T.
Acquire an image of the same preparation without light, considered black, and measure the grey level of the black and white image via Measure | Grey measure | Calibrate grey | Reference value = 1 | Measure | Calibrate | OK. This corresponds with a 0% transmittance; thus, an optical density of 1, according to OD = 2 - log T.
Acquire a color image of the field to measure in TIFF format with a resolution of at least 300 dots per inch (dpi). Create a binary image corresponding to the area stained. Set the three color thresholds (values between 0 - 255 for each) until the binary image exactly reflects the stained starch granules observed, via Image | Detect | Select the thresholds of red, blue and green | OK. Make repeatedly visual comparisons in various preparations and tissues to tune up the final detection levels. Store and use these levels for all preparations. Quantify the starch. Convert the original color image into a black and white image with the image analysis system. Use the binary image as a superimposed mask on the black and white image via Image | Binary Edit. Measure the sum of the optical density of every pixel under the mask via Measure | Grey level | OK and consider this value as the starch content in the measured field. Repeat steps 3.4.1 - 3.4.3 in four places of the ovary primordia to obtain a representative value of the starch content in the ovary of flower primordia. Repeat steps 3.4.1 - 3.4.3 and step 3.4.5 in different flowers of each collecting date. Dormancy studies require the determination of the moment when the chilling requirements are fulfilled. Despite the lack of phenological changes during winter under field conditions (Figure 1A), cherry trees do not recover the capacity of growth in suitable conditions until they pass a certain period under low temperatures. The regular transference of shoots to a controlled conditions chamber (Figure 1B) during winter time allowed the evaluation of the dormancy status of the flower buds. The evaluation of the flower bud growth was done by measuring the increase in bud weight. While, during dormancy, no changes could be observed after 10 days of suitable conditions (Figure 1C), once dormancy was overcome, the buds swelled and burst in the growth chamber (Figure 1D). The results of this analysis allowed the dormancy status of the buds to be established. Due to the different temperatures occurring during winter, dormancy was overcome at different dates, depending on the year. While, during the first year of the study, the breaking of dormancy occurred in January, the second year presented a milder winter; thus, the chilling fulfillment occurred about three weeks after, in February. Sweet cherry bears flower buds in spurs, where the apical bud is a vegetative bud and the lateral buds are flower buds (Figure 1C and 1D). Undifferentiated buds started to differentiate into flower or vegetative buds at the end of the summer, and when they enter dormancy in winter time, several flower primordia remain inside the bud, protected by numerous green scales and covered by brown outer scales (Figure 1C and Figure 2A). The dissection of the flower bud showed the small flower primordia inside (Figure 2A). Each flower bud contained one to five individual flower primordia (Figure 2B). Despite the small size of each flower primordium, all the parts of a flower are differentiated and can be distinguished: the pistil, the anthers, the petals, and the sepals (Figure 2C). The use of histochemical techniques (alcohol:acetic [3:1] fixation, paraffin wax embedding, microtome sectioning, and iodine-based starch staining) allowed the distribution of the starch within the flower primordium tissues to be observed (Figure 2D). Starch in the ovary primordium was quantified in each section. Four measures of 1337 µm2, at 40x magnification, represented the general layout of starch in the sweet cherry ovary primordium (Figure 3A). Starch granules were clearly distinguished from the background after I2KI staining (Figure 3B). The starch was identified by the image analysis system, by adjusting the color thresholds of red, green, and blue until all the starch granules observed were covered by the binary image created by the system based on the defined color parameters (Figure 3C). The values of starch content obtained were the result of the measure of the optical density of every pixel under the mask on the black and white image (Figure 3D). The quantification of starch revealed a consistent pattern of starch dynamic during winter (Figure 4). Consistently, the amount of starch in early winter presented an optical density value of less than 40,0003, while the maximum amount reached a value between 120,000 and 140,000 in both years. While the maximum value was reached in January during the first year (Figure 4A), it occurred in February in the second year (Figure 4B). Contrasting these results with the complexion of dormancy, the maximum amount of starch occurred concomitantly with the chilling fulfillment in both years. This approach requires the determination of the dormancy status (Figure 5A) concomitantly with the starch quantification on the ovary tissue (Figure 5B) in order to frame the changes in the starch content in relation to dormancy. Figure 1: Experimental set-up for the determination of the dormancy status of flower buds of sweet cherry. (A) Branches, during the winter, show the dormant buds closed and covered by dark brown scales. (B) This panel shows shoots transferred to the growth chamber. In mid-January, some cultivars remained dormant with the buds still closed (white arrow), while others were able to grow, showing swelled buds (black arrow). (C) This panel shows a detail of a shoot with dormant flower buds located laterally and a single vegetative bud located in the apical position in the spur. (D) This panel shows a detail of a shoot once dormancy was overcome after 10 days in the growing chamber, showing bud swelling. Please click here to view a larger version of this figure. Figure 2: Plant material preparation for starch quantification. 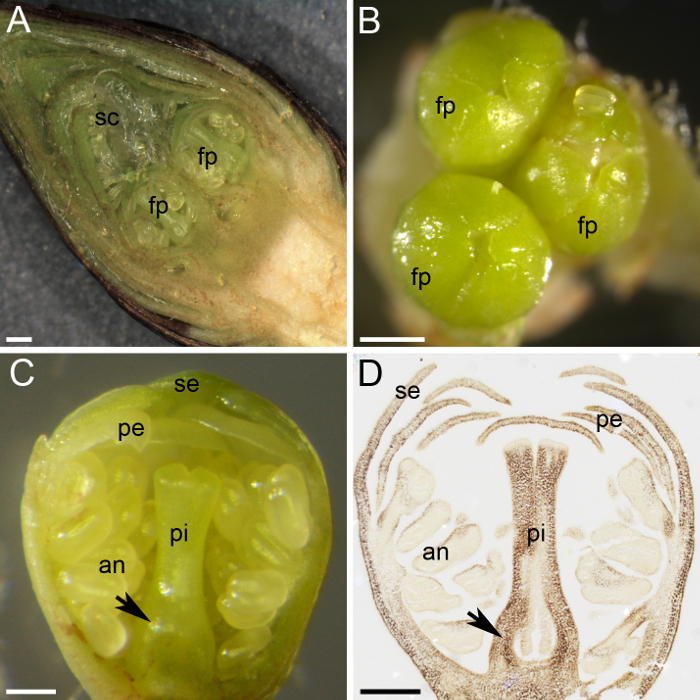 (A) This panel shows a transversal section of a flower bud, showing two flower primordia (fp) protected by numerous scales (sc). (B) Three flower primordia (fp) gather in a flower bud. (C) This panel shows a transversal section of a flower primordium, with all the whorls differentiated: sepals (se), petals (pe), anthers (an), and pistil (pi). The ovary primordium is distinguished at the base of the pistil (arrow). (D) A middle section of a flower primordium was collected and fixed in January, embedded in paraffin wax, sectioned, and stained with I2KI (dark brown) for starch. This panel shows the ovary primordium (arrow). The scale bars are 500 µm in panels A and B and 200 µm in panels C and D. Please click here to view a larger version of this figure. Figure 3: Starch quantification in sweet cherry ovary primordium. (A) This panel shows a middle section of an ovary primordium stained with I2KI, showing the four frames in which starch content was measured. (B) This panel shows a detail of the ovary primordium. The starch granules are stained in dark brown. (C) This panel shows a pseudocolor image in which starch corresponds to different shades of blue. (D) This panel shows a binary image mask covering I2KI-stained starch (blue) on the black and white original image. The optical density is measured only in the pixels of the original image covered by the mask. The scale bars are 100 µm in panel A and 20 µm in panels B - D. Please click here to view a larger version of this figure. Figure 4: Representative results of the starch quantification in sweet cherry ovary primordia collected monthly from the autumn to the spring during two years of different winter temperature conditions. (A) This panel shows the results from the years 2010 - 2011, which had a cold winter. The chilling fulfillment (snowflake) occurred in January, concomitantly with the maximum amount of starch. (B) This panel shows the results from the years 2011 - 2012, which had a mild winter. The chilling fulfillment (snowflake) occurred in February, concomitantly with the maximum amount of starch. The values are the mean ± the standard error of the mean. Please click here to view a larger version of this figure. Figure 5: Scheme of the experimental design to assess the dormancy status of buds and the starch quantification in the ovary primordia in sweet cherry. (A) This panel shows the workflows of the dormancy status determination: the plant material preparation, the process, and the results obtained. (B) This panel shows the workflows of the starch quantification: the histochemical preparation of the buds for a microscopic observation of the starch, the image analysis detection of starch, and the starch quantification. Please click here to view a larger version of this figure. Dormancy in woody perennials presents clear implications in fruit production and forestry in a changing climate, although the biological process behind dormancy remains unclear. Dormancy studies can be approached from different points of view, but the research looking for a biological marker for winter dormancy has intensified over the last years. However, most attempts to find an unequivocal indicator showing when a bud has broken dormancy have been unsuccessful3. The methodology described herein, combining histochemical techniques18 with analysis image, has been very useful to examine the relationship between carbohydrate reserves of a particular tissue and its physiological activity in sweet cherry buds during the different phases of dormancy5 and can be also applied to other species and tissues10,13,20. Carbohydrate reserves in the form of starch play an important role both in flower development and the reproductive process7,10,13,20,21,23 and in the seasonality of the temperate woody perennials6. Different studies on dormancy have paid attention to the starch within the buds24. However, due to their small size, several entire buds are required for the use of quantitative analytical methods, and the detection of quantitative variations in particular tissues or cells is limited by the masking effect of the surrounding cells. The combination of histochemical techniques with the image analysis system offers a good opportunity to study changes in the starch content of different structures inside the bud. This method has the limitation of preventing the quantification of the exact content of starch in the tissue but allows the relative starch content to be quantified to follow quantitative starch changes over time25 and to compare the starch content of different tissues13,20, cultivars, or years5. In order to allow the correct comparison of the values of optical density between fields, tissues, and buds, the calibration of the system (light conditions, staining intensity, and magnification) and the setting of color thresholds must be accurately established, stored, and used for all preparations. Starch staining and quantification based on potassium iodine allows the subsequent use of other stains after the washing of the section. Thus, different analyses can be performed without additional preparations and synthetic mounting media are not used5,20. Likewise, morphometric measurements26 can be done after the same preparations, allowing the pattern of starch accumulation to be framed in relation to the growth of different structures5,13. The method can be adapted to other structures or species with the adjustment of the color levels that use the analyzer to detect the starch, which can allow the study of other developmental processes that involve changes in starch content in small groups of cells. The relationship between dormancy release and starch accumulation in the ovary primordia unveiled by the use of this method provides a sound basis to understand the biological basis of dormancy and chilling requirements5. However, starch quantification by image analysis on paraffin-embedded sections could turn out to be very cumbersome and time-consuming to estimate the chilling requirements of a large number of cultivars. Future efforts have to be focused on studying reliable biological indicators that can easily indicate the dormancy status of the tree. 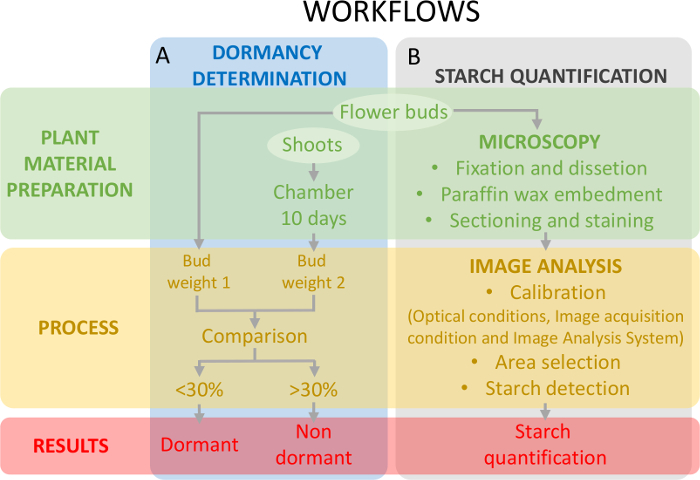 Meanwhile, the pattern of starch variations during dormancy can be used to frame further physiological and genetic studies, and the combination of histochemical techniques with image analysis described herein could be used in other woody perennial crops to quantify the starch content of different tissues in relation to dormancy. The authors gratefully thank Maria Herrero and Eliseo Rivas for their helpful discussion and advice. This work was supported by the Ministerio de Economía y Competitividad — European Regional Development Fund, European Union [grant number BES- 2010-037992 to E. F.]; the Instituto Nacional de Investigación y Tecnología Agraria y Alimentaria [grant numbers RFP2015-00015-00, RTA2014-00085-00, RTA2017-00003-00]; and the Gobierno de Aragón — European Social Fund, European Union [Grupo Consolidado A12-17R]. Kurokura, T., Mimida, N., Battey, N. H., Hytönen, T. The regulation of seasonal flowering in the Rosaceae. Journal of Experimental Botany. 64, (14), 4131-4141 (2013). Rohde, A., Bhalerao, R. P. Plant dormancy in the perennial context. Trends in Plant Science. 12, (5), 217-223 (2007). Fadón, E., Rodrigo, J. Unveiling winter dormancy through empirical experiments. Environmental and Experimental Botany. 152, 28-36 (2018). Fadón, E., Rodrigo, J., Herrero, M. Is there a specific stage to rest? Morphological changes in flower primordia in relation to endodormancy in sweet cherry (Prunus avium L.). Trees - Structure and Function. In Press (2018). Fadón, E., Herrero, M., Rodrigo, J. Dormant flower buds actively accumulate starch over winter in sweet cherry. Frontiers in Plant Science. 9, (171), (2018). Loescher, W. H., Mccamant, T., Keller, J. D. Carbohydrate reserves, translocation and storage in woody plant roots. HortScience. 25, (3), 274-281 (1990). Hedhly, A., et al. Starch turnover and metabolism during flower and early embryo development. Plant Physiology. (2016). Rodrigo, J., Hormaza, J. I., Herrero, M. Ovary starch reserves and flower development in apricot (Prunus armeniaca). Physiologia Plantarum. 108, (1), 35-41 (2000). Julian, C., Rodrigo, J., Herrero, M. Stamen development and winter dormancy in apricot (Prunus armeniaca). Annals of Botany. 108, (4), 617-625 (2011). Alcaraz, M. L., Hormaza, J. I., Rodrigo, J. Pistil starch reserves at anthesis correlate with final flower fate in avocado (Persea americana). PLoS One. 8, (10), e78467 (2013). Smith, A. M., Zeeman, S. C. Quantification of starch in plant tissues. Nature Protocols. 1, (3), 1342-1345 (2006). Eliceiri, K. W., et al. Biological Imaging Software Tools. Nature Methods. 9, (7), (2013). Rodrigo, J., Herrero, M. Influence of intraovular reserves on ovule fate in apricot (Prunus armeniaca L.). Sexual Plant Reproduction. 11, 86-93 (1998). Zhou, J., Spallek, T., Faulkner, C., Robatzek, S. CalloseMeasurer: A novel software solution to measure callose deposition and recognise spreading callose patterns. Plant Methods. 8, (1), (2012). Faulkner, C., et al. An automated quantitative image analysis tool for the identification of microtubule patterns in plants. Traffic. 18, (10), 683-693 (2017). Kuhn, B. F. Determination of starch in ovules of the sour cherry cv. "Stevnsbaer.". European Journal of Horticultural Science. 71, (3), 120-124 (2006). Johansen, D. A. Plant microtechnique. McGraw-Hill. New York, NY. (1940). Ruzin, S. E. Plant microtechnique and microscopy. Oxford University Press. New York, NY. (1999). Rodrigo, J., Rivas, E., Herrero, M. Starch determination in plant tissues using a computerized image analysis system. Physiologia Plantarum. 99, (1), 105-110 (1997). Alcaraz, M. L., Hormaza, J. I., Rodrigo, J. Ovary starch reserves and pistil development in avocado (Persea americana). Physiologia Plantarum. 140, (4), 395-404 (2010). 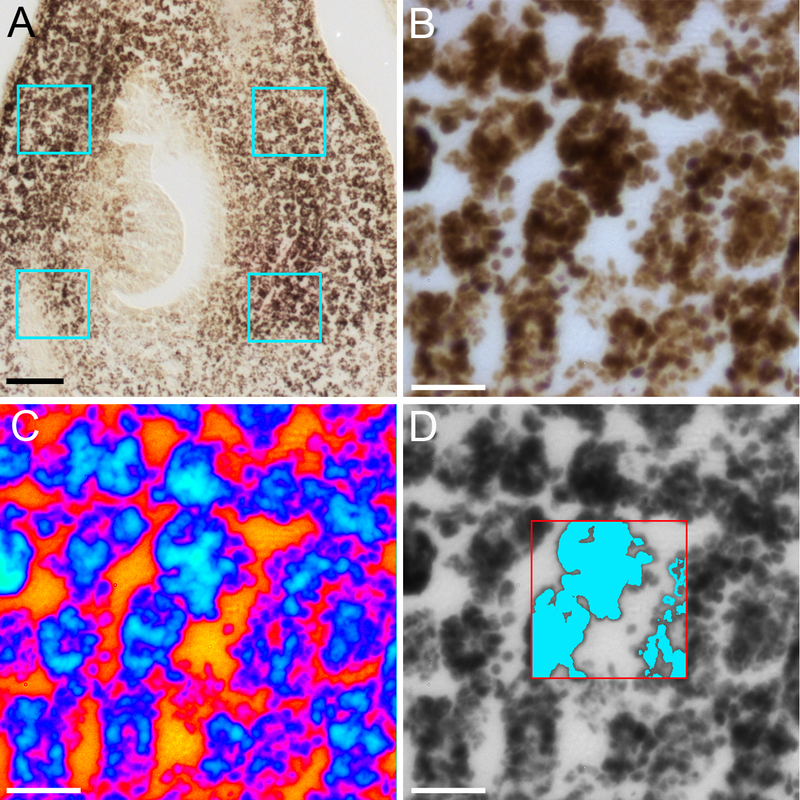 Suarez, C., Castro, A. J., Rapoport, H. F., Rodriguez-García, M. I. Morphological, histological and ultrastructural changes in the olive pistil during flowering. Sexual Plant Reproduction. 25, 133-146 (2012). Lang, G. A., Early, J. D., Martin, G. C., Darnell, R. L. Endodormancy, paradormancy, and ecodormancy - Physiological terminology and classification for dormancy research. HortScience. 22, (3), 371-377 (1987). Hedhly, A., Vogler, H., Eichenberger, C., Grossniklaus, U. Whole-mount clearing and staining of arabidopsis flower organs and siliques. Journal of Visualized Experiments. 2018, (134), 1-10 (2018). Kaufmann, H., Blanke, M. Changes in carbohydrate levels and relative water content (RWC) to distinguish dormancy phases in sweet cherry. Journal of Plant Physiology. 218, (July), 1-5 (2017). Herrero, M., Dickinson, H. G. Pollen-pistil incompatibility in Petunia hybrida: changes in the pistil following compatible and incompatible intraspecific crosses. Journal of Cell Science. 36, 1-18 (1979). Carpenter, A. E., et al. CellProfiler: image analysis software for identifying and quantifying cell phenotypes. Genome Biology. 7, (10), R100 (2006).